simple choreography for your mouth--even if it has two left feet! Looking to make your next production more authentic? More believable? I've worked with hundreds of actors, and would love to work with you! My approach is simple, tangible, and FUN!! It incorporates what the actor sees and feels—rather than solely focusing on what the actor hears and imitates (often inaccurately). I do not use the confusing abstract concepts many speech methods do. Principles are learned physically rather than memorized mentally. This ensures improved intelligibility, retention, consistency, and believability, as well as expanded acting choices—something you just can’t get from listening alone! I'd love to work with you on your next acting or public speaking project, assist you in mastering multiple accents/dialects, or just help you improve your overall speech! Coaching sessions are currently offered via FaceTime or Skype, or in person in Los Angeles. Private one-on-one coaching for individual actors offered on a short-term or ongoing basis. Learn one or more accents/dialects. Need lightning fast assistance? Have a last minute audition with only a few lines? With the Quick Skim Option, you'll learn only the accent/dialect vocal changes needed for your specific script. The goal is for you to sound as believable as possible when speaking your scripted lines. 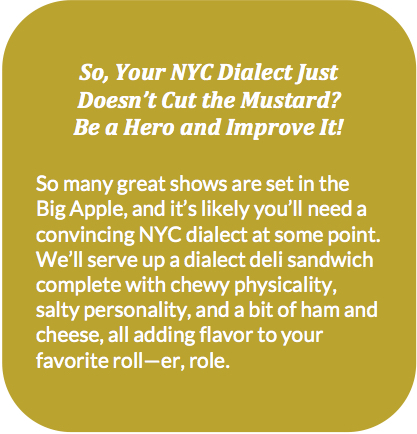 Need to prepare for an upcoming audition or role requiring an accent or dialect? 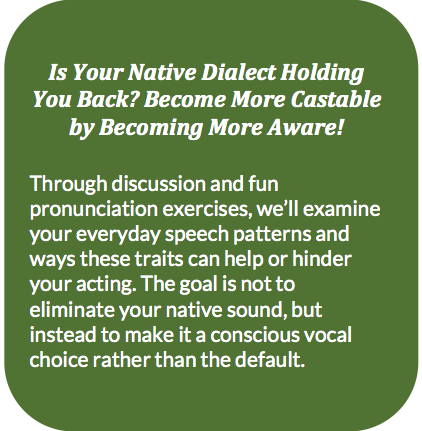 With the Learn Option, you'll incorporate the accent/dialect's "leading action" into your muscle memory to ensure consistency. 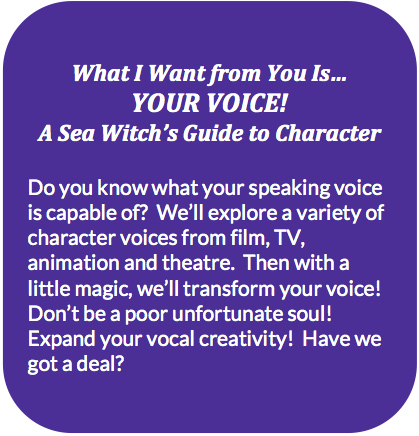 We'll cover all the vocal changes for the accent/dialect in case you need to improvise in character. 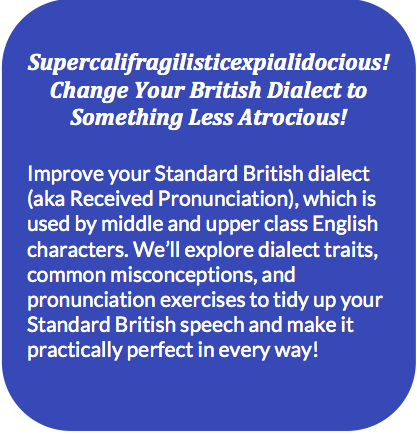 As you progress, we'll work to fine-tune the accent/dialect to fit your character choices and ensure intelligibility. The goal is for you to feel adept using the accent/dialect as an acting tool. Sessions valid for 90 days from date of purchase. Coaching for stage, film and voice over productions offered for entire casts, lead roles only, and/or individual character parts. 3) A final follow-up observation with notes held shortly before opening. Are you directing or producing a film with characters from another place or time? How about an animation project? Do your actors sound clear and convincing? I would love to work with you and your actors to ensure their speech is both believable and intelligible! Coaching is flexible and can be conducted prior to and/or during a film shoot or recording session. (Coaching prior to shooting/recording is highly recommended.) I also work with actors in post-production ADR looping sessions. Introductory workshops offered with or without a follow-up option. Workshops can be geared for kids, teens or adults. Public workshops are offered from time to time. More public workshops coming soon! Do you have a class or group interested in learning a particular accent/dialect? Maybe you're interested in basic voice and speech? I would love to work with you to design a learning experience that is fun, educational, and applicable to your specific needs! Private workshops can be customized for various ages, acting proficiency levels, and group sizes.